Abstract: The deployment of even moderately sophisticated optical signal processing devices requires integrated solutions. In this talk I discuss new methods that enable intelligent and adaptive electronic and optical signal processing. I will review novel receiver structures and an integrated electronic and electro-optical devices platform technology based on epitaxial GaN/Lithium Niobate. This new materials capability enables the separate optimization of both electronic and optical functionalities in a monolithic structure. We have demonstrated the monolithic integration of AlGaN/GaN high electron mobility transistors (HEMTs) with LiNbO3 optical waveguides. I will review the current performance of these structures and describe fully integrated systems-on-a-chip which may enable sophisticated optical processing with integrated electronic monitoring, optimization and control in a single package. Biography: Stephen E. Ralph is currently Associate Professor of Electrical and Computer Engineering at the Georgia Institute of Technology. He received the BEE degree in Electrical Engineering from Georgia Institute of Technology. In 1988 he received the Ph.D. degree in Electrical Engineering from Cornell University for his work on the optical detection of highly nonequilibrium transport in heterojunction devices. In 1988 Dr. Ralph began a postdoctoral position at AT&T Bell Laboratories where he demonstrated a number of optical devices based upon nonequilibrium transport. In 1990, Dr. Ralph joined the IBM T. J. Watson Research Center where he was the first to explain enhanced far infrared emission from semi-insulating materials. In 1992 he joined the faculty in the Physics Department of Emory University. Here he demonstrated one of the first time resolved far infrared spectroscopic investigations of ultrafast carrier transport. In May of 1998 Dr. Ralph became an Associate Professor at Georgia Tech. 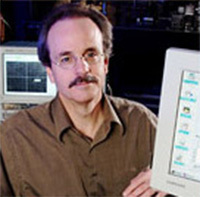 At Georgia Tech Dr. Ralph’s research efforts focus on the development of optical and electrical devices and methods which allow intelligent signal processing in both the optical and electronic domains. Dr. Ralph is a senior member of the IEEE, and a member of the Optical Society of America.